@.ac was a collaborative group that came together one of our Seed Funded commissions. It was certainly one of the most oblique of the projects, more subliminal and subversive and one of the most direct engagements with our idea of a Manifesto For A New Wakefield. 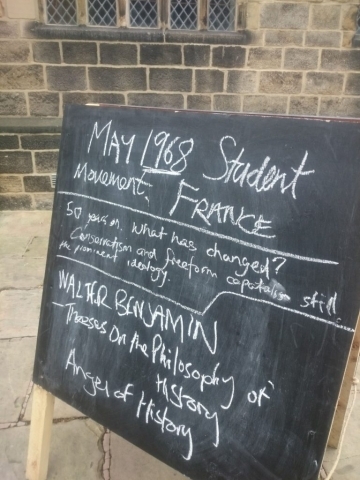 The project took the 1968 protests as a jumping off point and – 50 years on – reflected and reworked those ideas for Wakefield and Long Division. It tackled themes of revolution, education, capitalism and the power of visuals. Pieces of work, slogans etc were dotted around Wakefield in the month leading up to the event, with leafleteering and seminars taking place on June 2nd. We designed four A4 flyers and printed 2000 copies of each flyer. 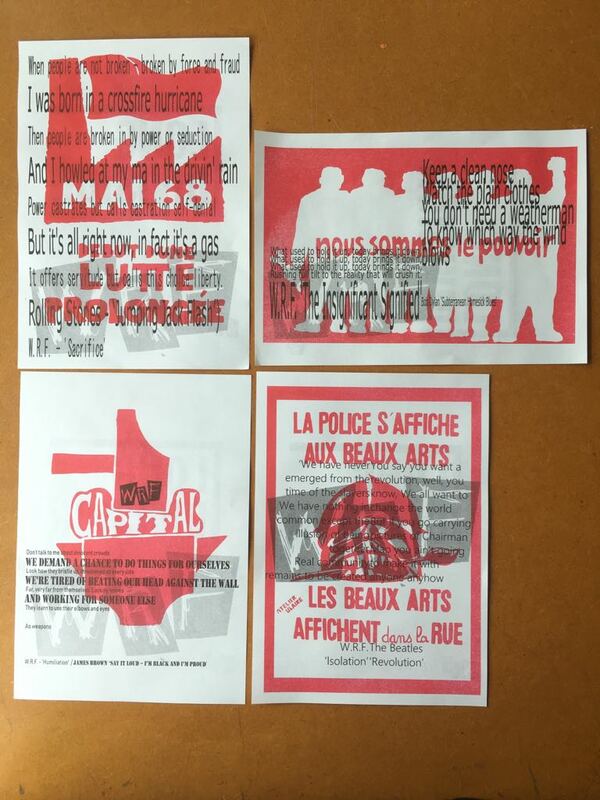 The images on the flyers were produced 50 years ago by the Atelier Populaire, a group of radical art students who had occupied the print rooms of the École des Beaux-Arts and turned it into a production line for agitprop to foment the events of May ‘68. 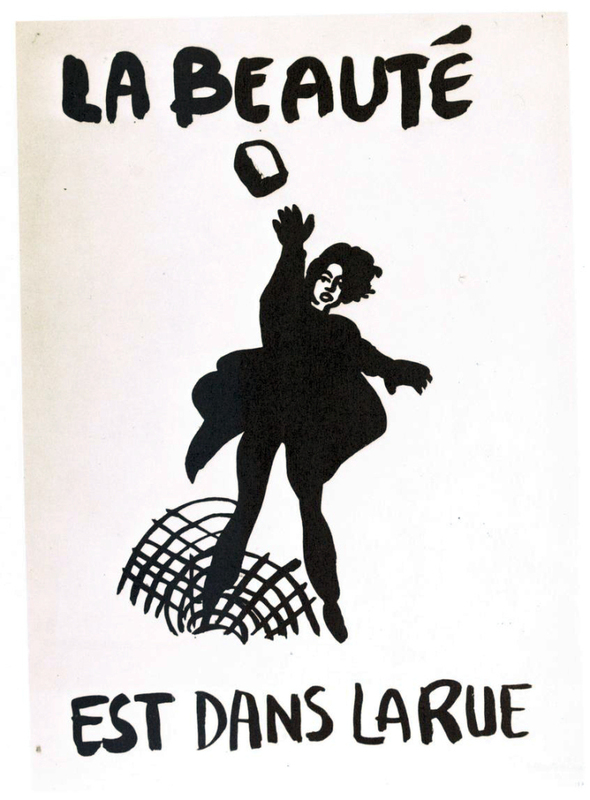 These screen-printed images were then plastered all over the walls of the Sorbonne and the streets around the left bank of Paris. Effectively they were the visual identity of the revolution. However, we are not just interested in their revolutionary anti-capitalist message, which of course remains as relevant as ever. produced six of these designs and also produced three additional band posters. These were printed in A1 and A3 formats. What kind of places did you manage to distribute them? We distributed the flyers all around the city on the day of the festival, handing them out during the performance outside the Elizabethan Gallery and then at various venues when people were watching the bands. 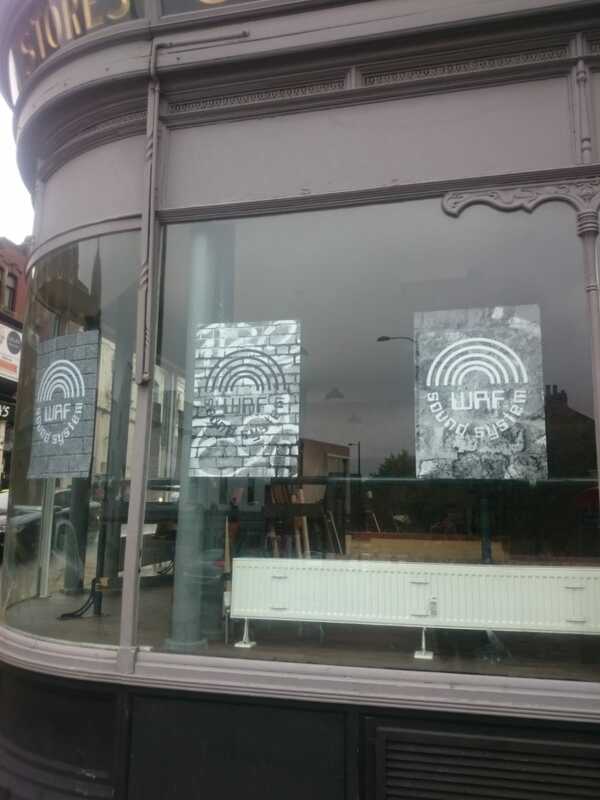 We also installed posters / flyers at Wah-Wah Records, The Art House, The Theatre Royal, the now derelict Unity Works bar, Eye Wood Vintage, Create Cafe, and the Wakefield Beer Exchange. What was amazing for us was how open everybody was to the project, with many people suggesting ideas for its development. In his book Relational Aesthetics, the curator Nicolas Bourriaud suggests that ‘a relational art (an art taking as its theoretical horizon the realm of human interactions and its social context)’ can bring about a ‘radical upheaval of the aesthetic, cultural and political goals introduced by modern art’. For us, this refers to the fact that in the artworld even the most overtly political art is depoliticised by its incorporation and display in rareified and exclusive white cube galleries, not to mention the commodification of art at the hands of the art market. Instead, to be truly political, you need to create artworks that build social relationships and work towards social cohesion. In short, artworks that build the kind of society that we would like to live in in the future. The realisation of this artwork has not only got us on speaking terms with most of the creative community in Wakefield but, we hope, in some small way acted as a mechanism to bring that community together. Much like Long Division itself, of course. What is @.ac? Who is involved? Our artists’ group name is @.ac, which we took from the universal suffix attached to every university e-mail address, e.g. rhudsonmiles@liverpool.ac.uk. It is supposed to signify academic institutionality, and we were quite interested in its hierarchical or elitist connotations. It is interesting how even an e-mail address can connote institutional exclusivity and privilege. At the same time, it is utterly generic to every university so, for us, it also connotes the anonymity and universal plight of the university labourer whose ever increasing and under appreciated toil get buried beneath spectacular new campuses and cynical student recruitment campaigns; all of which are paid for by the artificial repression of staff wages. Phonetically, you can also pronounce this name as ‘attack’ which we also like because it expresses the political militancy of the collective. We define @.ac as a rhizomatic and completely non-hierarchical arts collective without any permanent members. Now the project is complete, and looking back to the beginning of it, what was the initial idea behind the commission and how did it fit into the idea of a Manifesto For A New Wakefield? We decided to appropriate aphorisms from 1968 texts as WRF lyrics, and combine these with lyrics from songs made in 1968 by James Brown, Bob Dylan, The Beatles and others. 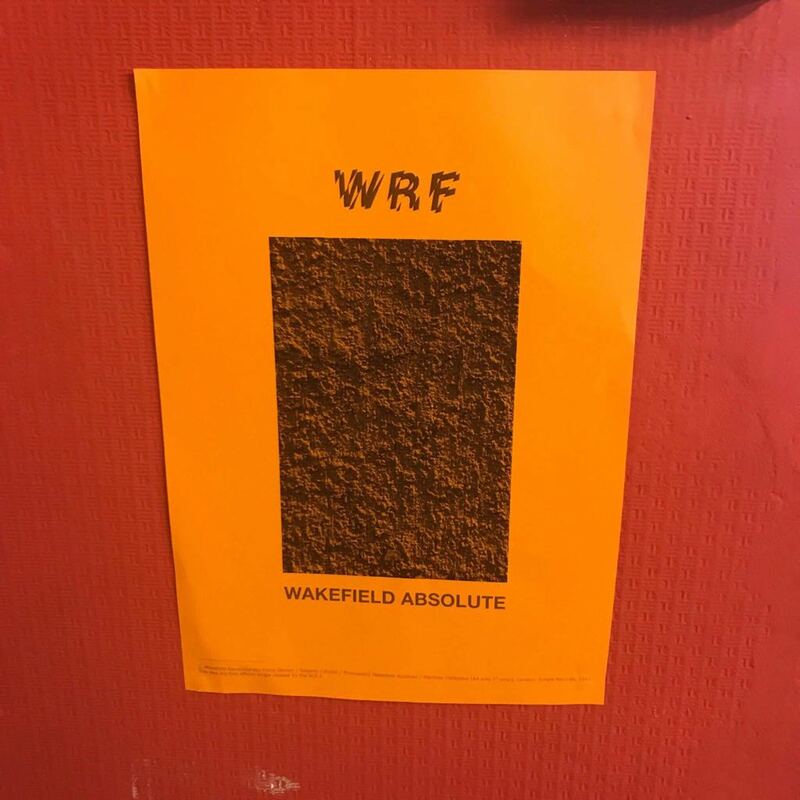 These were distributed throughout Wakefield with the aim of sparking debate around the relationship between rock music and political theory. We also used the WRF posters we produced as a way into this discussion. People loved speculating about the band and contributing to their biography, and this then served as a way in to further discussion on art and politics. Much of your project was covert and hidden – do you feel you had an impact on audiences and did you get any feedback? 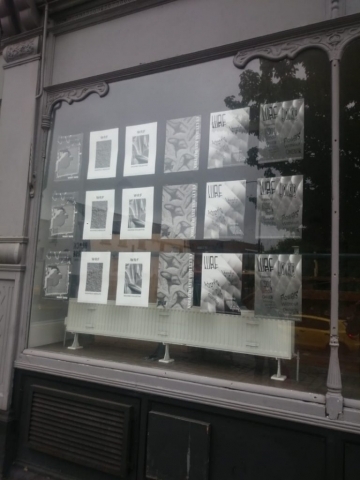 As you suggest, our aim was to insert the posters and flyers into existing situations, such as the wall displays of Wah-Wah records, the window displays of The Theatre Royal, and alongside commercial letting adverts the now vacant Unity Works bar. 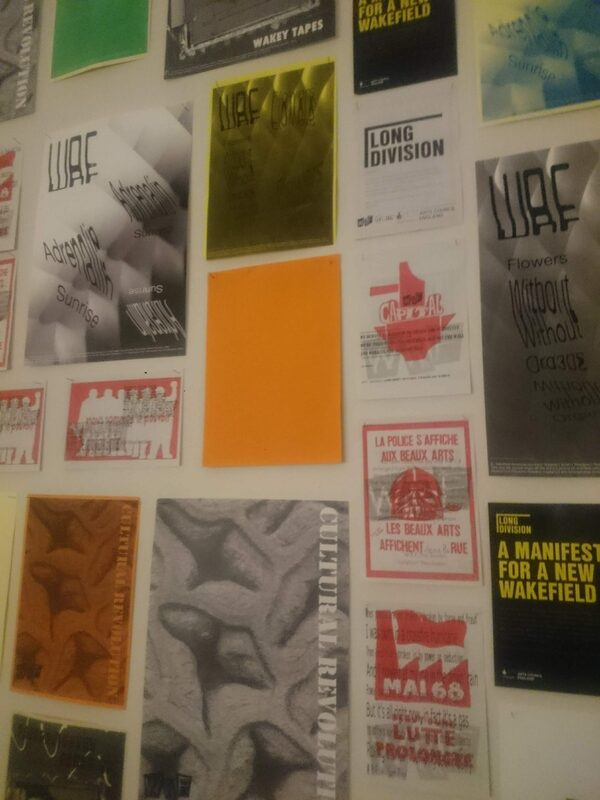 It was important to us that the placement of our posters was consistent with the aesthetic of the surrounding environment, because we wanted to maximise the integration of our fictional proposal with the real urban life of Wakefield. In Wah-Wah Records, we left the installation of the posters completely down to the owner Alan, who had already curated a cool anarchic collage of band posters over the shop walls. Similarly, at The Theatre Royal we let Jenny, the Learning and Participation Officer, suggest a space for display in the cafe. This latter intervention was so subtle that it could have easily gone unnoticed by the majority of the public. However, reaching a mass audience is less important to us than the creation of singular moments of qualitative human interaction. The posters are primarily relational objects, and secondarily objects of visual contemplation. I suppose their success could be measured by the activity that proliferated around them. In the case of the Theatre Royal installation, this was a space that we had never entered before and the artwork helped us to create relations with people we would otherwise have never known. The same goes for Wah-Wah Records, which we have frequented in the past as customers, but after our intervention we feel like we are connected to the shop and its staff on a much deeper level, more like colleagues or co-creators. We had this experience in just about every venue we worked with so for us, the artwork’s main achievement was to work against the regulated, cold, and alienated city environment and act as a mechanism to bring the creative community of Wakefield together. 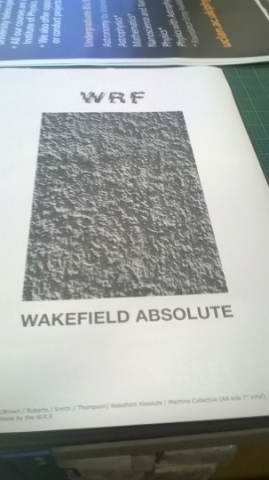 If the Manifesto For A New Wakefield is about anything, it has to be about this, right? 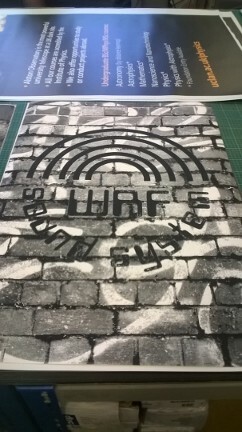 We found the myth of WRF was something that people really responded to and in fact people embellished the narrative we developed in really exciting ways – gigs that might have happened at The Red Shed, eccentric musician artists who had served time in Wakefield prison, famous Wakefield bands who might have shared a bill with WRF, and so forth. I understand the poster we installed in the Theatre Royal is now on display permanently in the office upstairs, which gives the project a nice, albeit small scale, degree of permanence. Finally, we have to give a massive shout out to everyone at the amazing Art House, whose space we shamelessly hijacked for the Art Walk and festival. Jen and Simon were endlessly patient and supportive. Even though we are based In Wakefield, embarrassingly we had never been to the Art House, so this project has given us the chance to get on speaking terms with its staff, understand their creative aims and objectives, and establish productive relationships with them as co-collaborators. The Art House is awesome, thanks again to everyone there. Aside of the printed materials, you created these other aspects too, such as the revolutionary talks outside the Elizabethan Gallery. How did these develop and how did they fit in with the project? conversation about culture, politics, education, and society in general, and we always end the projects feeling more integrated into society, at a human level, than when we started. 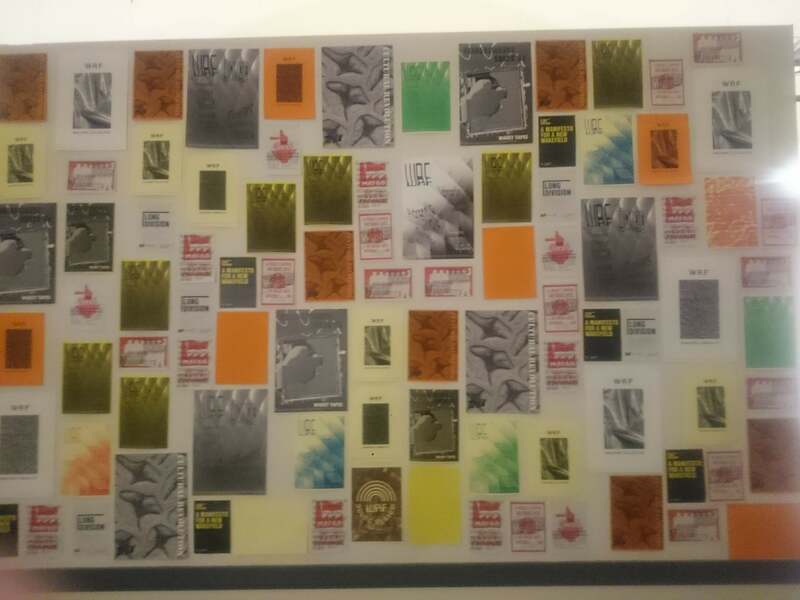 It is certainly a completely different experience than creating works for sanitised and exclusive white cube galleries, which in many ways are more exclusive than contemporary universities. 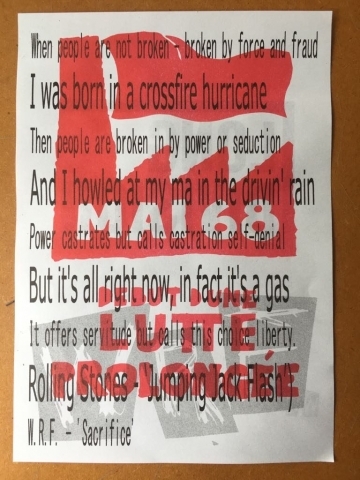 In this relational ambition, the Precarious University performances are exactly the same as the flyer and poster works produced for Long Division. Finally, we are also proud to be producing impermanent and immaterial works like these that are completely impossible to commodify by the art market. Do you feel the commission allowed you to create or try something that you would not otherwise have been able to achieve? We are endlessly grateful for the commission by Long Division, which has allowed us to connect with the creative community of Wakefield at a collaborative and interpersonal level that would have been difficult for us to achieve independently. In many ways, this epiphany is the most important thing to come out of the project. It seems strange to us that, in a city as small and compact as Wakefield, there are so many amazing creatives working in relative isolation and ignorant of each other’s practice. We really hope that the Manifesto For A New Wakefield can be a catalyst for this community to come together. We have just produced an artists’ film documenting a residency we have just completed, Messy Democracy, at Hanover Project, Preston. 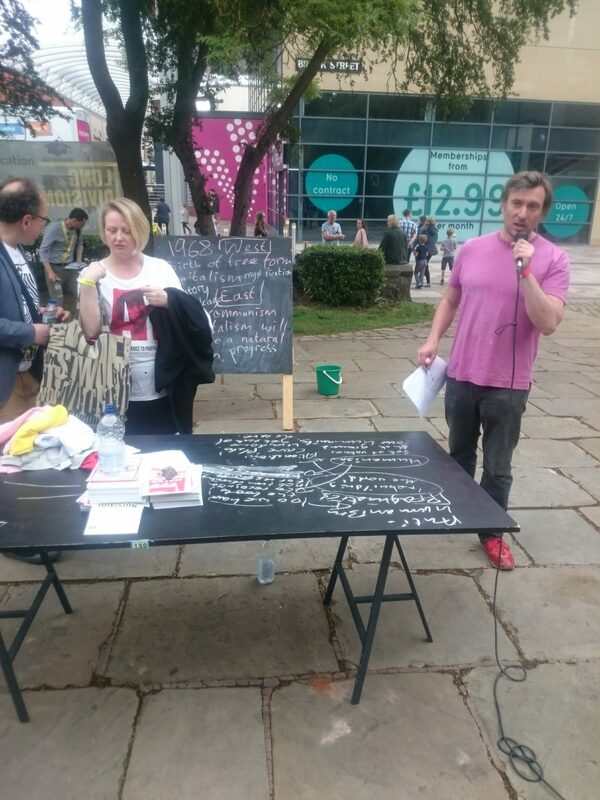 Messy Democracy took place in Hanover Project from 9th–27th April 2018. Throughout this period the gallery was cladded in chipboard, transforming the space into an arena of live art production, curated by a democratically elected steering group of UCLAN students. We completely abandoned authorial control of the exhibition, which then functioned as a space of student-led learning and making, which we forward as a critique of both the hierarchies and exclusions endemic to both the artworld and the university. This film has recently been shown at a conference on 1968 and its Legacies, at King’s College London, and we plan to tour the film around film festivals in 2019. We are also going to taking a version of our Precarious University project to an international audience, firstly to an ELIA event in Rotterdam in November, and hopefully further afield in 2019. We hope that the Manifesto For A New Wakefield takes off, and hope to be a part of its development over the next year. 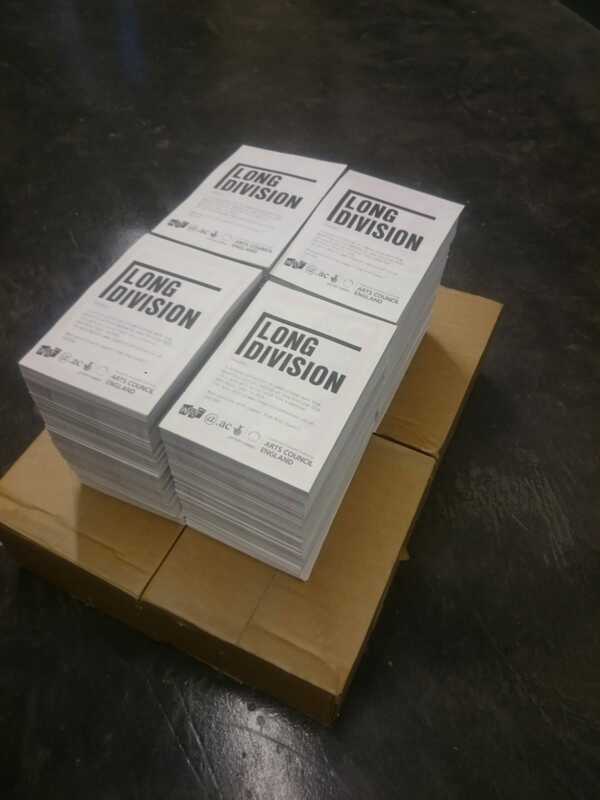 Also, we hope to work with the Art House again in the very near future, though they don’t know this yet, and of course we are already excited about Long Division next year, which we would love to be involved with again. In the immediate future, we are gonna buy the new Johnny Marr album on coloured vinyl from Wah-Wah Records and watch England win the world cup.